Some people wish to rewrite history because of their bias. Some people naively impose today's Irish reality, today's moral standards to the reality of Ireland in 1916. Reality of Ireland under so called Great Britain, as a colony of grate britain, was a Ireland which was one of the poorest places anywhere in Europe, well it was so for the Irish! a Ireland where infant mortality and poverty related diseases were higher and worse than almost anywhere else in Europe. Ireland part of a so called union! the irish once colonised by terror and by force, were nothing but useful cannon fodder for further crown colonial enterprises. 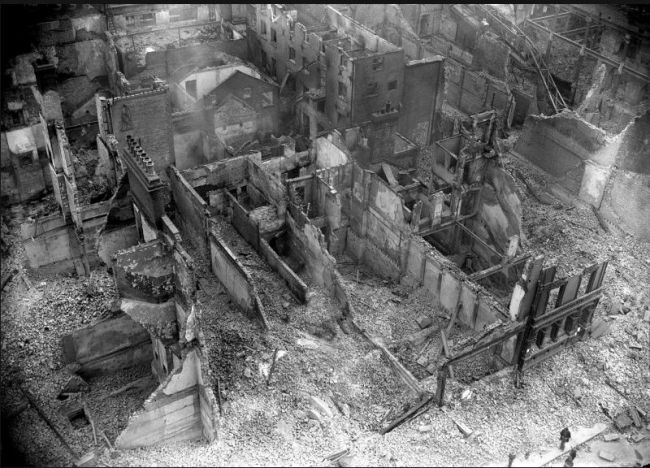 Reality of how Westminster and foreign crown viewed and considered the Irish people can be seen in their reaction to the Irish rebels and the destruction of Dublin. But what about all those Civilian deaths in 1916! Some bias or naive 21st Century rewriters like to suggest was the responsibility of Irish rebels! Who actually caused most of the civilian deaths? and they had a choice! Does anyone think Westminster and their crown would have sanctioned the military a free hand to bomb and mortar as they pleased if it was in London. Does anyone seriously believe Westminster would have allowed a war ship to sail up the thames in order to bombard by shell the city of London, and alongside cannons and artillery pieces shell London city non stop for days killing hundreds of civilians in the process. British politicians and British military and British crown who would all be in Geneva facing WAR CRIMES against humanity! just 2 war crimes charges the British accused would be found guilty of. 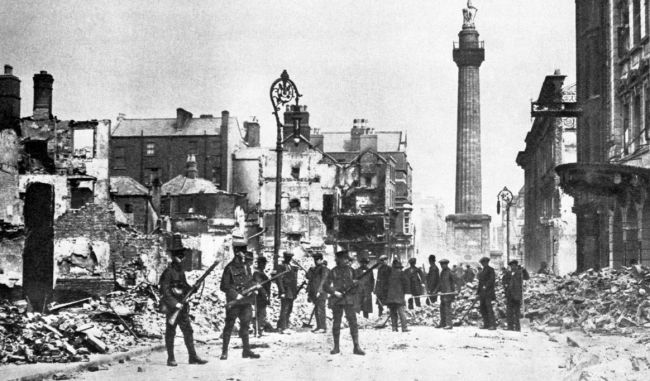 The 1916 Easter Rising is one of the defining moments in Irish history. President Michael D Higgins has called the Rising a "stunningly ambitious act of imagination". 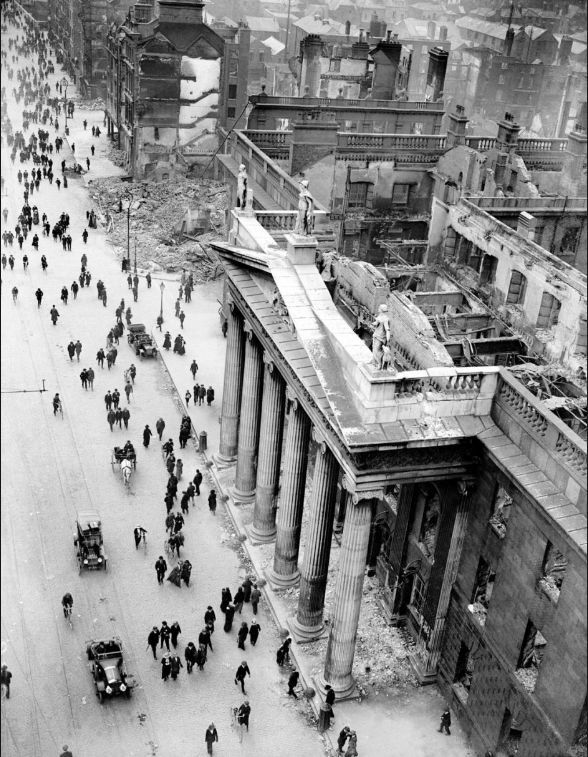 In 1916 Ireland was on the cusp of great change: the struggle for Home Rule, the Dublin Lockout and backdrop of World War provided a context of great turmoil amid a swelter of ideas that were clashing in Ireland and beyond. The Proclamation, read aloud by Padraig Pearse outside the GPO, was a radical document ahead of its time in calling for the establishment of a republic as Europe's monarchies clung to power, and also in its clear stance on the equal rights of women in society. 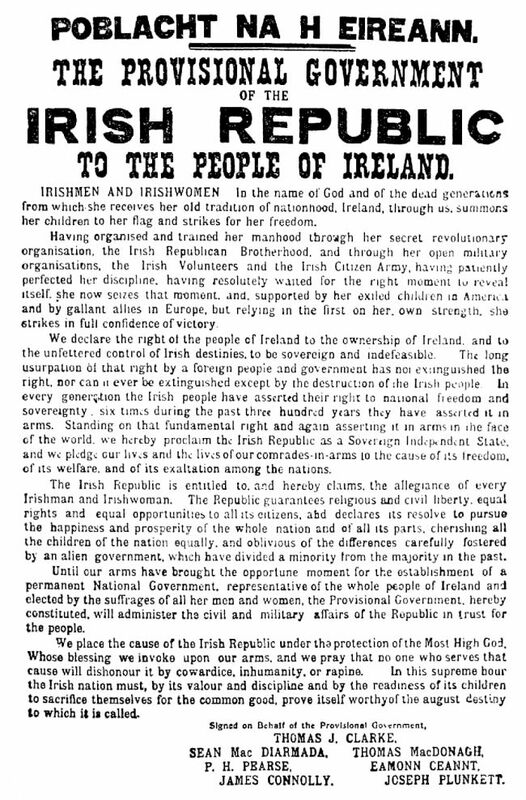 The Proclamation begins with an appeal to "Irishmen and Irishwomen" and it also declares support for a new Irish government "representative of the whole people of Ireland and elected by the suffrages of all her men and women". Yet, without the subsequent onset of conflict between 1919 and 1921 following the triumphant republican performance in the 1918 general election, the Rising would be remembered as little more than a footnote in Irish history, alongside those glorious failures of past generations. The fact that the Rising set in motion the process that would lead to the creation of an independent Irish State makes it stand apart, worthy of commemorating as a landmark moment in Irish - and British - history. The context of Irish history is crucial to appreciating the rebellion. Critics have dismissed the Rising as an anti-democratic, violent event, condemned by the political class in Ireland at the time, and an action that gave succour to subsequent violent attempts to establish a sovereign Irish republic. That ignores the reality that British involvement in Ireland already lacked democratic legitimacy. As Tom McGurk put it: "British rule was entirely a product of conquest and therefore devoid of moral authority." British conduct throughout a 19th century that brought the Famine, the Land League campaign and the struggle for Home Rule convinced republicans that acting decisively in an extra-parliamentary manner was required to deliver freedom from Britain. In any event the concept of Irish democracy had been demeaned over centuries by the establishment and propagation of a superior caste in Ireland, from Plantation to Penal Laws and beyond, and the evidence provided by the formation of the Ulster Volunteers and the Curragh mutiny did little to suggest that Britain would enforce the will of the Irish people. The power, might and cruelty of the British Empire were all evident in the Boer War, which preceded the Rising by a mere 15 years, when a scorched earth policy and concentration camps were used ruthlessly to defeat the Boers, annihilating a civilian population in the process. This was the reality of the context of the conflict which was triggered in 1916 and continued in the tumultuous years that followed. One of the most significant legacies of the Irish revolution was how it inspired other struggles worldwide and also led to the demise of the age of empire. The struggle of the Irish rebels was a genuine one in defence of a small nation at a time when those who governed empires were cynically using the slogan of fighting to defend small nations as a cloak to wage war in pursuit of their imperial interests (the treatment meted out at Amritsar in 1919 and in Iraq in 1920 betrayed the cruel lie behind the rhetoric which helped motivate many to make the fateful decision to enrol and perish at the Somme and in other battlefields). Edward Said noted that the Irish struggle triggered by 1916 was to become a "model of 20th century wars of liberation". The significance of an oppressed European nation rising up against an imperial power was noted by Lenin and inspired others including Gandhi and Ho Chi Minh. Today, the Rising allows Irish people to reflect upon the history of the independent Irish State, how it has developed and evolved, including when set against the vision and expectations of those who devised the Proclamation and who died in 1916. In this Irish people are doing nothing different to what the French do on Bastille Day and the Americans on the Fourth of July each year. But as well as being the pivotal moment giving rise to the foundation of the southern State, the Rising also serves to remind northern nationalists of our place in the Irish nation: the Republic proclaimed in Easter 1916 was one of 32 counties, not 26. In that sense commemorating the Rising serves to reassure northern nationalists of the validity of our aspiration and place within the Ireland of 2016, with the Good Friday Agreement providing a framework to pursue constitutional change. In the north of Ireland we are grappling with the reality of competing narratives over our history. It is entirely wrong to suggest that nationalists and republicans are involved in "rewriting history", as such a charge erroneously implies that a uniform interpretation of history was ever agreed and is now being rewritten. In truth, what we are seeing today is that a shared and increasingly equal Northern Irish society has allowed for the articulation of a non-unionist narrative in the public space in a manner that simply was not previously possible. This is a good thing for Northern Irish society. The Rising struck a blow against the idea of empire and imperialism, beginning a pattern repeated across the British Empire as the 20th century progressed. Ireland paved the way for small nations 100 years ago - and for that we should be rightly proud. People should also remember that the crown and Westminster hated Ireland and the Irish and were vindictive for decades. It was Irish Americans and the Europe Union that enabled Ireland to defy.